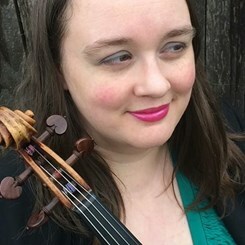 Kate Carrick began studying the violin at age four. Her education included weekly private lessons, masterclass/recitals, school orchestra, Youth Symphony, and in highschool she attended the Seattle Conservatory of Music. Kate followed her passion for music to Spokane where she performed as a member of the Spokane Symphony while persuing a BA in music from Eastern Washington University. Kate is dual proficient in violin and viola and teaches students of all ages the skills necessary to achieve their goals! Currently she performs with local orchestras including the Olympia Symphony! In her free time Kate enjoys spending time with her family, gardening, and making her own soap! Request Lessons with Katherine today!